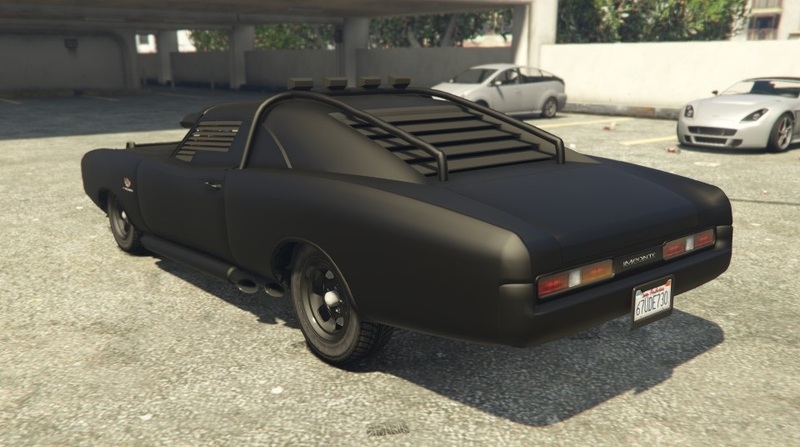 The Imponte Duke O’Death is a 2-door armored muscle car in the enhanced version of GTA 5, being exclusively obtained in the singleplayer and therefore absent in GTA Online. It is a specialized variant of the Dukes. The vehicle is exclusive to players who have already played seventh console generation versions of the game, and is not available to all eighth generation players. 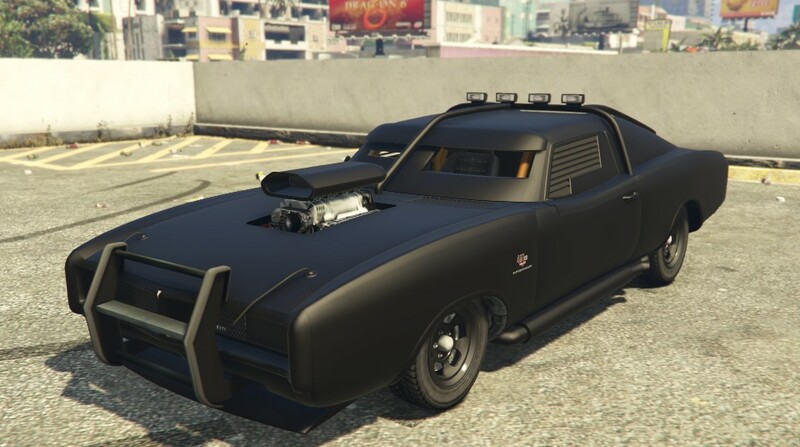 The Imponte Duke O’Death is a highly modified variant of the Imponte Dukes. as such, it is based on the 1968-1970 Dodge Charger. It features the same chassis and body as the normal Dukes, but comes with custom frontal bullbars, a rollcage, an external rollbar with lights attached, decreased ground clearance and protective armor plates covering the windows and windshield. It also features a unique supercharger ram air scoop on its hood. Its paintjob seems to come in matte black as default. The Duke O’Death’s design may be a reference to the film Death Race, which revolves around the racing of heavily armored (and armed) road vehicles. Specifically, the 2008 remake features several cars similar in design to the Imponte Duke O’Death. The Imponte Duke O’Death is powered by a supercharged, high-output V8 engine, capable of providing excellent torque and top speed. In contrast with the normal variant of the Dukes, this vehicle seems to have better acceleration and top speed, although the vehicle has a tendency to oversteer at high speeds. Another downside is its poor braking abilities, however these can be easily tweaked to a much better working state in any Los Santos Customs mod garage. Durability is excellent, as the Duke O’Death is able to ram and push other vehicles off the road with ease, and the car’s bodywork is very strong. Crash deformation is very minimal, and it can be said that this vehicle has some of the best durability traits in its class. In a junkyard at the southern end of El Burro Heights. In Grand Senora Desert at the eastern end of Harmony. Can be bought from www.warstock-cache-and-carry.com for $279,000. The Duke O’Death is exclusive to players who have already played seventh console generation versions of the game so it will not be available to all eighth generation players.